As an iPhone owner, one of the biggest disappointments so far has been the lack of Flash support. Although iPhone has promised Flash support many times before, it still has yet to arrive. 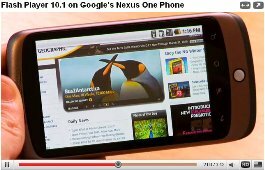 The Google Phone Nexus One comes equipped with Flash Player 10.1. And because the Nexus One has Flash support, this puts it at a huge advantage over the iPhone. With the support of Flash on the Nexus One, you’ll be able to experience web pages, interaction, and online gaming in ways that are not possible on the iPhone. Flash is the missing piece in mobile web browsing that really brings the web to life, and the Google phone Nexus One gains a substantial advantage over the iPhone because of Flash support.